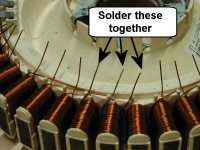 From factory the Fisher & Paykel stator is wired into one large star winding, producing 3 phase AC when used as a alternator. 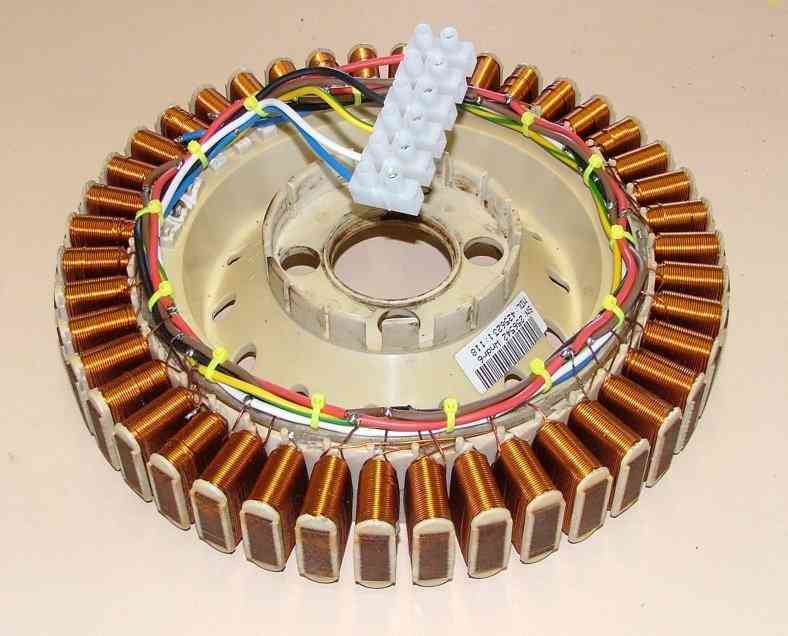 If we were to use this standard stator on our windmill the output voltage would range from 0 to 400 volts unloaded, and up to 3-4 amps maximum loaded, not a very usable range for charging batteries, and very dangerous to work with. 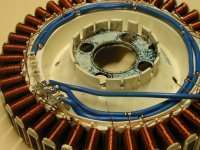 The standard F&P Smartdrive stators have either a string of 14 or 12 coils (also called "poles") for each phase. 3 phases, means 42 or 36 coils total, depending on what model stator you have. 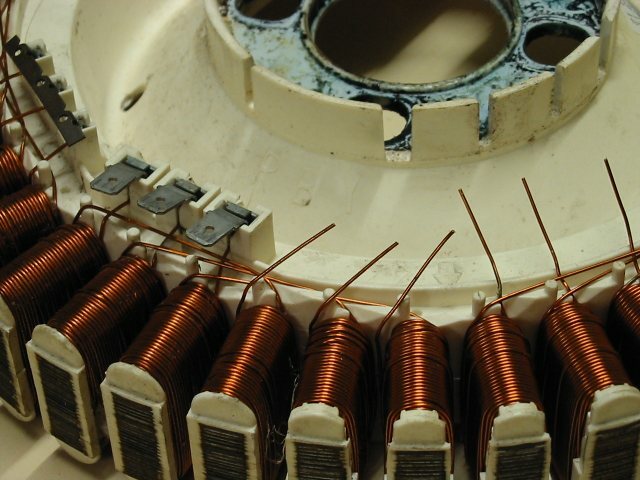 We are going to rewire the stator into shorter strings to reduce the voltage, and then connect these strings in parallel to increase the current. There are 2 F&P Smartdrive motors commonly used for our windmill alternators, the old 42 coil model, and the new 36 coil model. 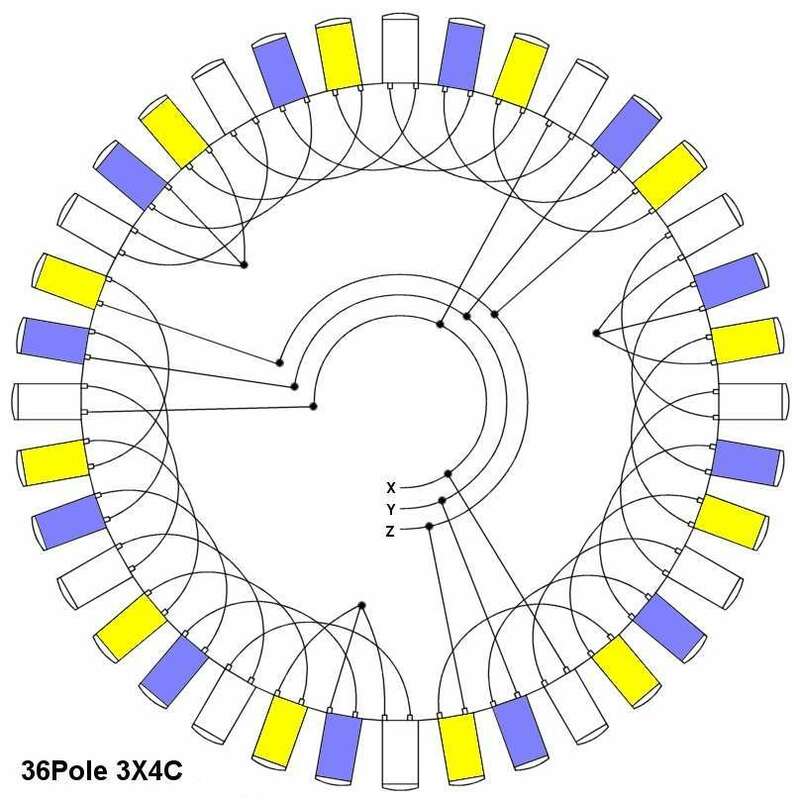 Where we refer to the stator as a whole, we generally call it a 42 pole or 36 pole type. To avoid any confusion, we've come up with a new naming scheme to describe the different re-wiring options. Originally instead of the word "coils" we were using "poles" to describe the number of coils or poles in series. This caused confusion, as P ( poles ) can be mistaken for "Parallel". We ended up with 2 different naming schemes that caused a few people to incorrectly wire up their stators. 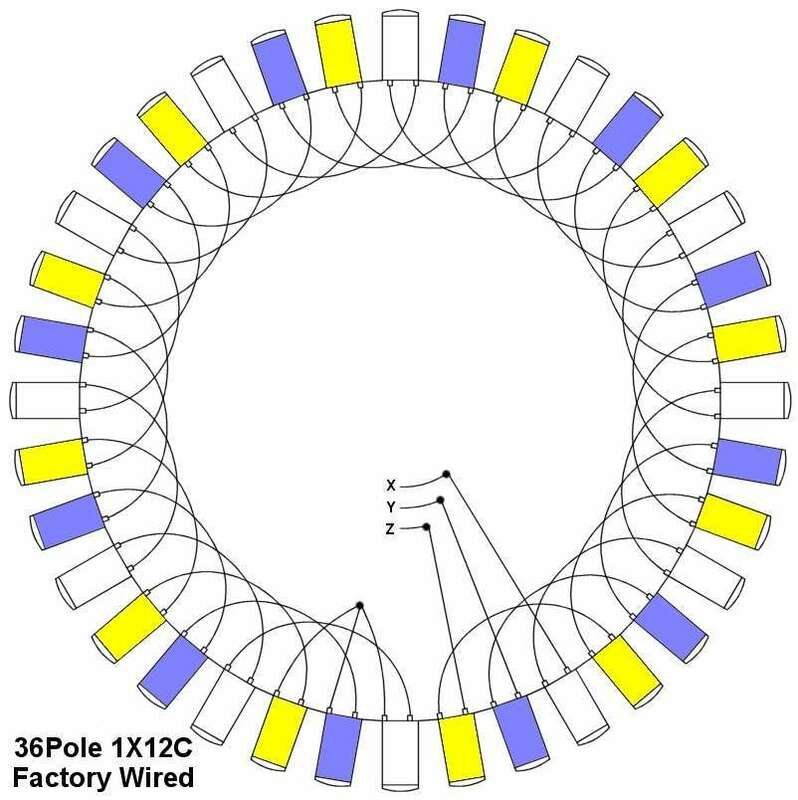 Most windmill re-wires are using the 42 pole model, wired in a 3 phase star configuration. However, if its a little different, just add the details to the code. 2X7C Delta would be as above but wired in delta. 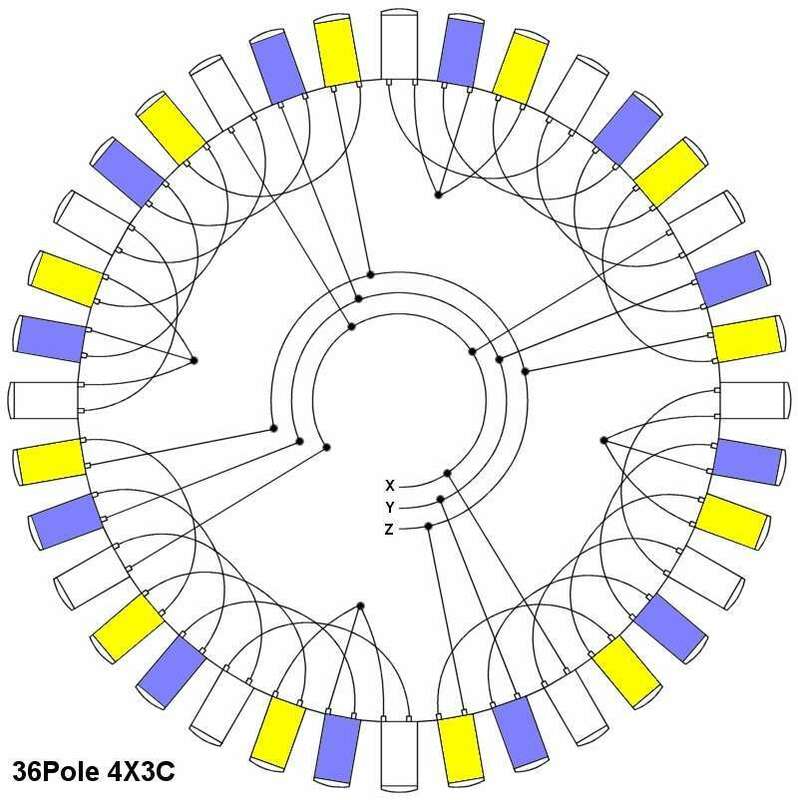 36Pole 3X4C would be a 36 pole stator wired with 3 times 4 coils in series. 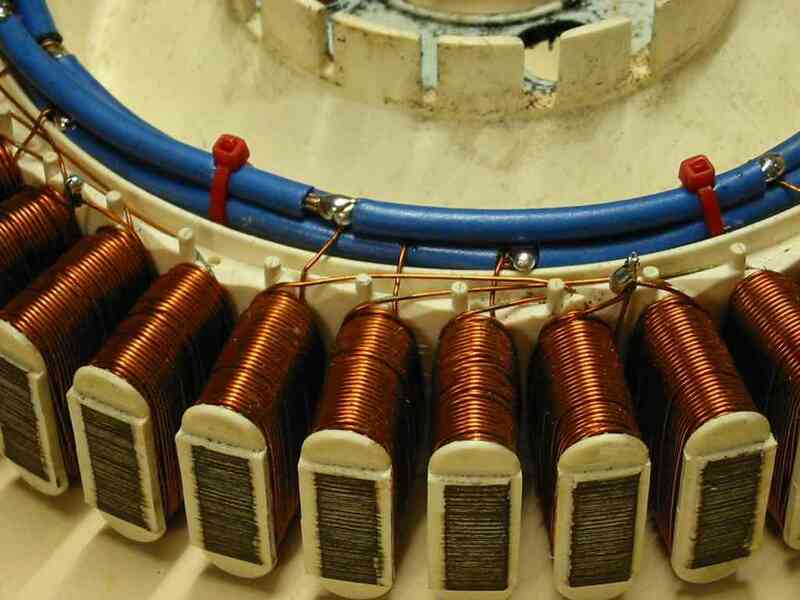 7Phase 2X3C is a 7 phase conversion with 2 times 3 coils in series. First up, the old 42 pole conversion. 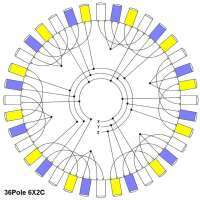 The 42 pole stators are still the most common and easiest to source. Click on the image to see the full size diagram. At right is a diagram of the stator factory winding. I've labeled the phases X Y & Z. Remember you can click on these diagrams to see full size. This a 1 times 14 coils, making it a 1X14C using our naming scheme. 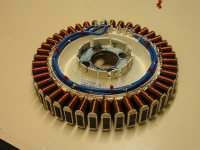 This is a stator "split into two", so we end up with 2 times 7 coils in series. Best suited to 48 volts or 24 volts in low winds. 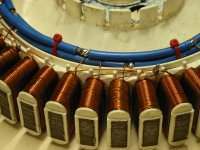 This is how we rewire the stator as 7 groups of 2 poles star configuration, suitable for most 12 and 24 volt applications, depending on how fast your turbine runs and what wire size the stator is. See What F&P is it? to identify which stator you have. 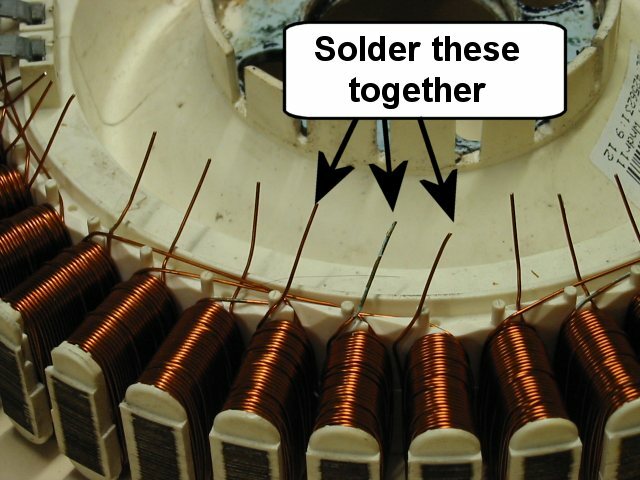 And this is how we can wire the stator to use for either star or delta configurations. Anyone who read the Silicon Chip articles I wrote will be familiar with this layout. The star/delta option gives you the ability to connect the stator as a star or delta. Delta will produce more power at high revs, but star will start making power at lower rev's and is the preferred option. Cut the winding at every 6 poles. 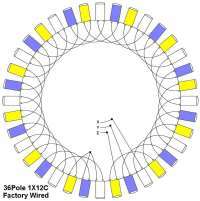 This will give you a total of 7 groups of windings, each with 6 poles, 2 poles per phase. Remember you can click on these photos for a closer look. With sandpaper, clean the enamel off all leads for aprox 15mm from ends. If you are making a 3 wire star stator, twist and solder the star mid point connections. Strip lengths of wire as shown. Use wire capable of at least 15amps. Solder three ( or six if you are going for the 6 wire star/delta option ) lengths of heavy electrical cable ( 4-5mm dia copper ) to the original connection terminal terminals, then strip back 5mm at each connection point. Cut the cables at the last connection point. This will form our power "bus". Wrap each star end wire around the bus wires as shown, and solder. You will need a good soldering iron for this. Once all star windings have been soldered, cable tie the bus wires to secure the assembly. 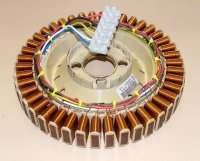 The finished stator. Give the stator a good coating of varnish ( or similar ) to protect from the weather. 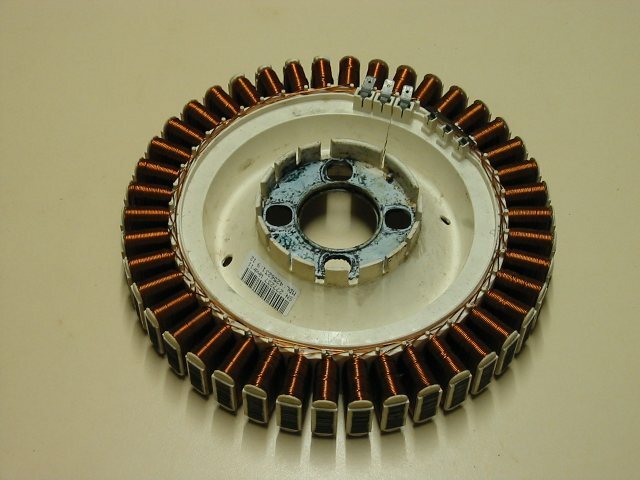 If you decide to wire as a 6 wire delta/star configuration, you stator should look something like this. If you use a 6 wire star/delta configuration, the diagram at right will show you how to connect the output leads together. The suggested rewire diagrams are a guide only, there are no "use this re-wire with this turbine to get this voltage" rules at this stage. This is the standard factory wiring. This would work best for a slow running windmill, like a savonius type. Rewired as 6 coils in series. Again suitable for low speed turbine or high battery voltage ( 48 volts or above ). Rewired as 4 coils in series. Suitable for low speed turbine on 12 volt system or high speed turbine on 48 volt system. General all rounder. 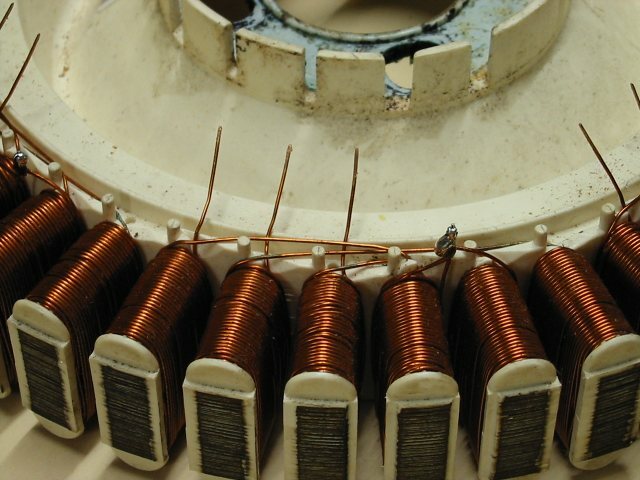 Rewired as 3 coils in series. 12 or 24 volt systems. Another general all rounder. 2 coils in series. 12 volts, high speed turbine. Forum member David has done some extensive testing of the F&P and put together the following Cut in Volts vs RPM tables. Using these tables, you can make a good educated guess on what would be the best rewire option for your available F&P hardware and system voltage. The Second table is for the 36 pole stator with White arrow head rotor cap and the newer stronger Black rotor cap. 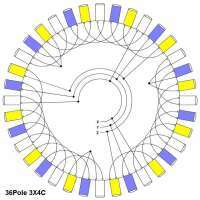 Third and Forth tables are for Staggered stators (both 42 & 36) and are grouped in pairs. 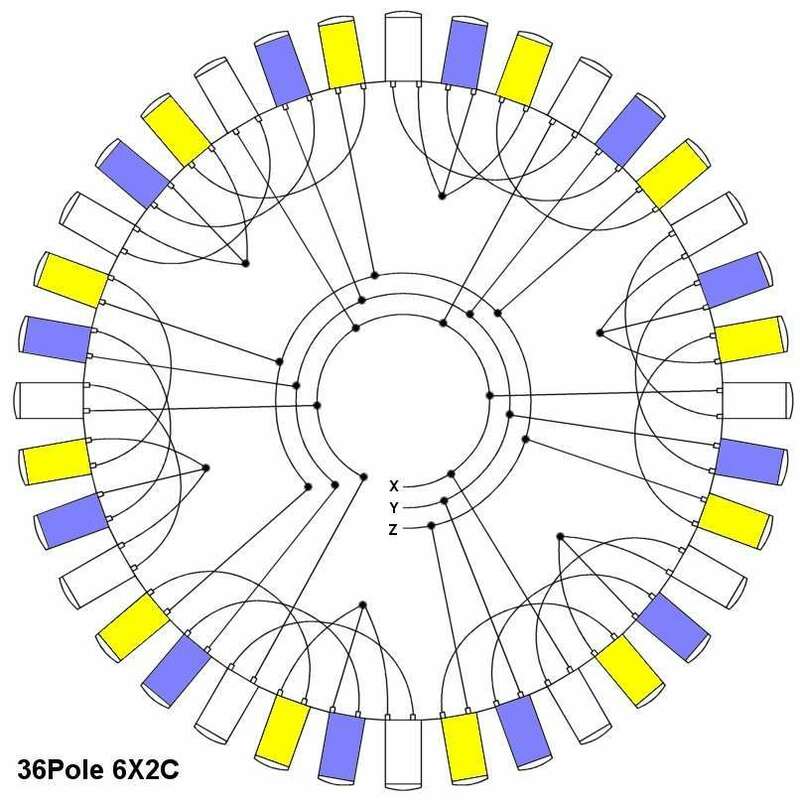 Example on 42 pole stator cuts “1x6C is used with 4x2C”, 1x5C used with 3x3C etc. 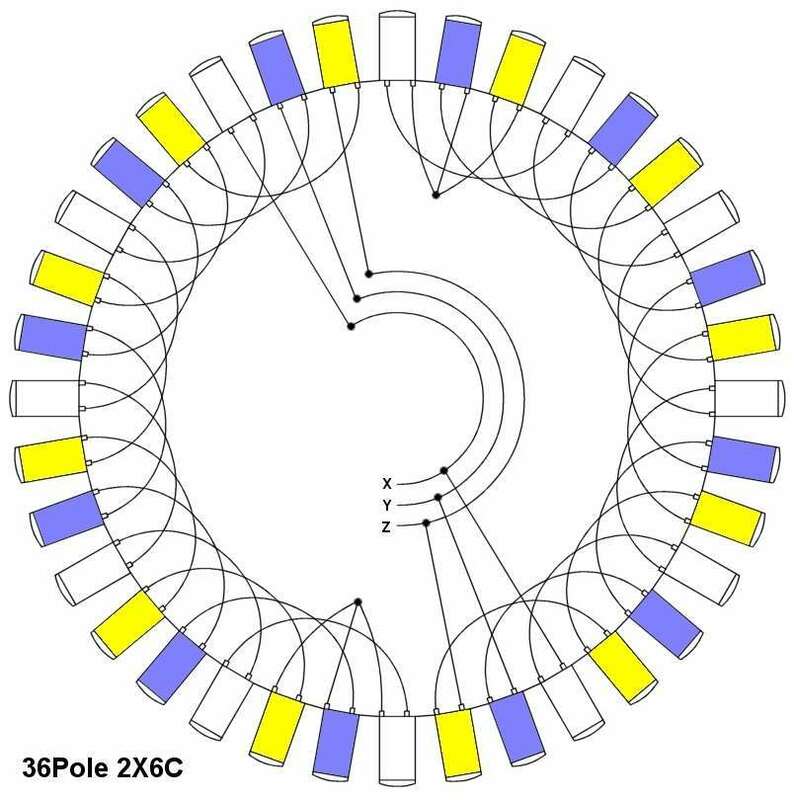 On a 36 pole stator cuts “1x6C is used with 3x2C” then 2x4C used with 2x2C. *Please note where it states "Too Low" refers to RPM below 30 and "Too High" is above 500 RPM. Too low RPM is most likely to stall the wind turbine blades at start up. Too High the turbine will likely be freewheeling and produce little or no power even in high winds. Numbers in “Red” maybe be too low for most blade setups to allow a smooth start up without stalling them. Hope this provides a rough guide to those new to here. There are also a couple of other rewire options you may like to consider. The 7 phase conversion. This uses a 42 pole stator with the magnet hub from a 36 pole stator, a real mismatch in components. By itself, it doesn't work, no output, but if you rewire the stator as a 7 phase alternator, you get very good power output and no startup cogging problems. 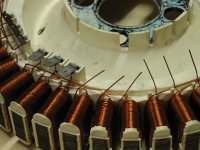 Staggered windings involves re-wiring the stator into groups with different coil counts. Different coil counts mean different cut in RPM's, and this gives a alternator with a better power curve.